One cannot underestimate the importance of effective airport security. Since the end of the cold war, no single event has had a greater effect on the global geopolitics and defense than the 9/11 attacks which were made possible by the pre-9/11 airport security processes loopholes. The airport security technologies, industry & markets are going through major shifts. Markets once dominated by the U.S. TSA are now moving to European, Middle Eastern and Asia-Pacific airports. New and maturing sectors and technologies such as automated border control kiosks, cargo screening, cyber security, airport perimeter security systems and advanced ICT technologies create new market niches and fresh business opportunities. According to the report, the aviation security market is forecasted to make a robust comeback, generating a 2014-2020 CAGR of 7.4%. 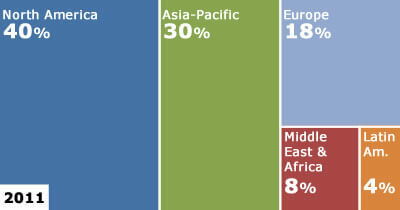 The global air passenger volume growth, particularly in the Middle East and Asia-Pacific regions. The growing importance of enhanced airport security. Advancements in airport security technology and infrastructure. The fast growth of the Asia Pacific airport sector (e.g., China new airports and upgrades, 2 out of every 3 new airport projects in the world are in mainland China). The moderate growth of the aviation sector in other regions. Worsening of radical Islamists terror threats to European & Middle East airports. The need to streamline airport security processes using airport security baggage scanners and additional technology and reduce passengers’ waiting time. Replacement and upgrades of outdated airport security systems such as baggage scanners and metal detectors . By 3 revenue sources including Product Sale, Aftersale Revenues, Planning, Consulting & Training. 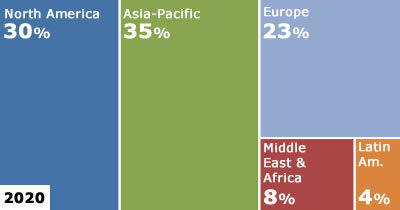 By 5 regional markets: North America, Latin America, Europe, Middle East and Africa, Asia-Pacific. By 16 airport security technology markets: Baggage & Cargo X-ray Scanners, Security-Related ICT & Cybersecurity, Whole Body Scanners (AIT), Explosive Detection Systems (EDS), Security-Related Baggage Handling Systems (BHS), Explosives Trace Detectors (ETD), Metal Detectors, Liquid Explosives Detectors, Shoe Scanners, Workforce & Visitors ID Documents Screening, Automated Border Control, CCTV & Ground Radar Surveillance, C2/C4ISR Systems, Airport Perimeter Security, Counter-MANPAD, Multi-modal Security Systems and other Modalities. By 44 national markets: U.S., Canada, Mexico, Columbia, Brazil, Argentina, other Latin American countries, U.K., Sweden, Denmark, Netherlands, Belgium, Germany, France, Spain, Italy, Austria, Czech Republic, Poland, Russia, other European countries, Turkey, Israel, Saudi Arabia, UAE, Qatar, Kuwait, Iraq, Nigeria, South Africa, other MEA countries, Azerbaijan, Kazakhstan, Pakistan, India, China, Taiwan, South Korea, Japan, Singapore, Malaysia, Indonesia, Australia, other Asia-Pacific countries. The “Global Airport Security: Technologies, Industry & Markets – 2015-2020” report is a resource for decision-makers in the aviation security community. It has been explicitly customized for airport security industry executives to identify business opportunities, developing technologies, market trends and risks; as well as to benchmark business plans. What are the procurement models, and how do they affect the industry’s business models? What are the main end-user trends? How can the supplier industry introduce new products and services to meet the security needs of future airport operating models? What will the market size be in 2015-2020? What are the key and pipeline airport security technologies including airport security baggage scanners? How does the balance of passenger satisfaction & operational efficiency versus stringent security measures affect the security industry? What are the opportunities to increase your market share? Where are the most attractive business opportunities? What are the inhibitors to your growth? What are the risks to your market share? Who are the key vendors in this market? What are the threats faced by the key vendors? With 819 pages, 317 tables and 468 figures, this 3-volume “Global Airport Security: Technologies, Industry & Markets – 2015-2020″ is the most extensive Aviation Security market & technology research project ever conducted. This landmark airport security market report offers for each of its 212 sub-markets 2011-2014 market data and analyses, as well as 2015-2020 forecasts and analyses. Airpot security companies operating in the market (profiles, products and contact info): American Science and Engineering Inc., Auto Clear, IBM, Lockheed Martin, ADANI, Red X Defense, Syagen Technology. Thermo Electron Corporation, Biosensor Applications, Hitachi, Scent Detection Technologies, Ketech Defence, Mistral Security Inc, Appealing Products Inc. (API), ChemSee, DetectaChem LLC, Scintrex Trace, Flir Systems, Implant Sciences Corp., Ion Applications Inc, BAHIA Corp (Sibel Ltd.), CEIA, Fisher Labs, Brijot Imaging Systems, TeraView, ThruVision Systems, Gilardoni SpA, L-3 Communications Security & Detection Systems, QinetiQ Ltd., Westminster International Ltd., LIXI Inc, MilliVision, MINXRAY Inc., Morpho Detection Inc., Nuctech Co. Ltd., Rapiscan Security Products Inc., Scanna MSC Ltd., Smiths Detection, Vidisco Ltd. 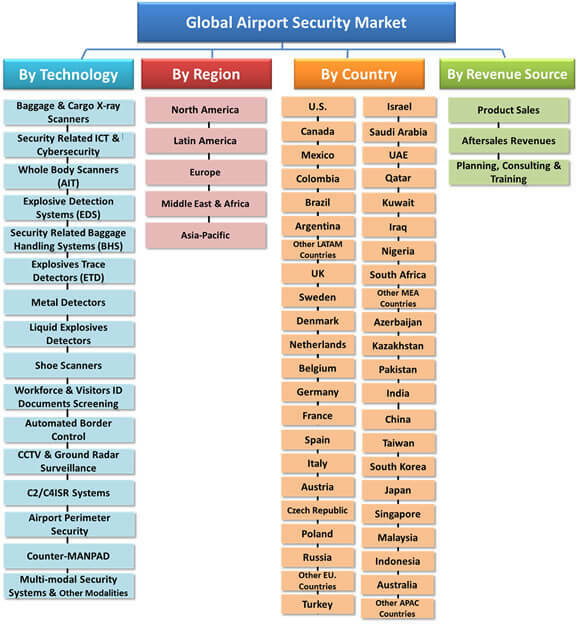 Airports Security Screening Data at over 1300 airports in 40 countries: The airport security market report provides screening data at each and every airport segmented by over 1,300 airports which screen 2,552 million passengers (89% of the global aviation passengers). For each country, all the airports with over 100,000 annual screened passengers are presented, including details on the number of screened passengers and the annual growth rate. 4.33 Rapiscan Security Market Products , Inc.
27.4 For Whom is this Report Intended? Table 10 TSA Passengers and Baggage Installed Base [Units] and Procurement Plans Statistics by Modality. Figure 38 Electromagnetic Spectrum of the THz-Region. Figure 109 Average X-ray Screening Rate [Passengers per Hour] by Region.